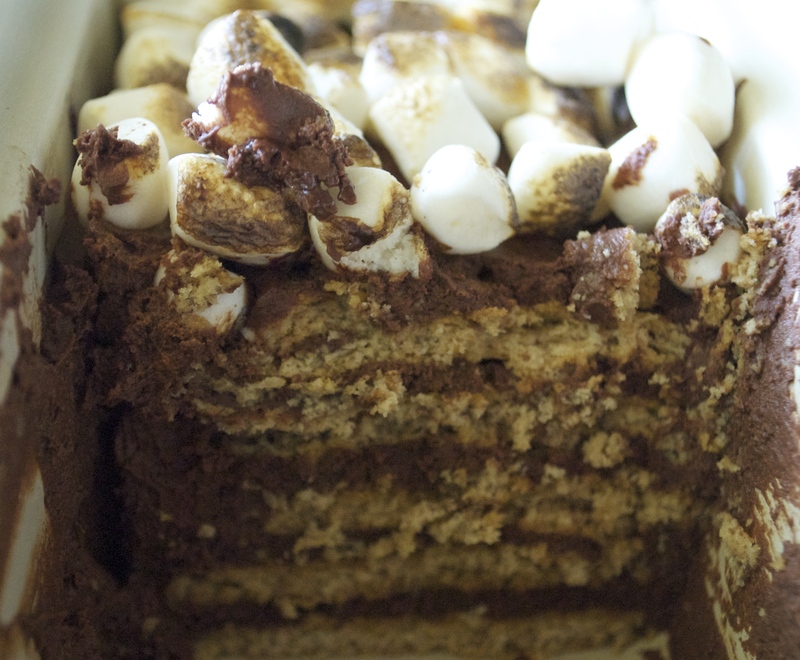 This ice box cake can hug you too. 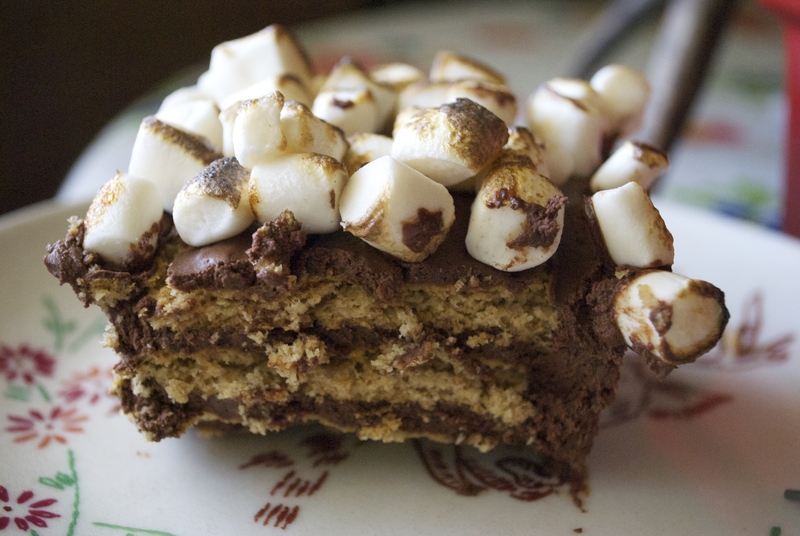 It doesn’t have the typical crunch of a s’more because it’s a cake, but all of the flavors are still there to remind you of how good they are together. For this easy recipe, you’ll need to head on over to Oh, Ladycakes to make her amazing 2-ingredient chocolate mousse. Double her recipe for a full ice box cake. I used plain, unsweetened non-dairy milk. I also use a microwave to melt chocolate because I know how to do it without burning. If you’re unsure, use a double-boiler. If you don’t have one, they are very easy to create at home with a pot and mixing bowl. a marshmallow topping. 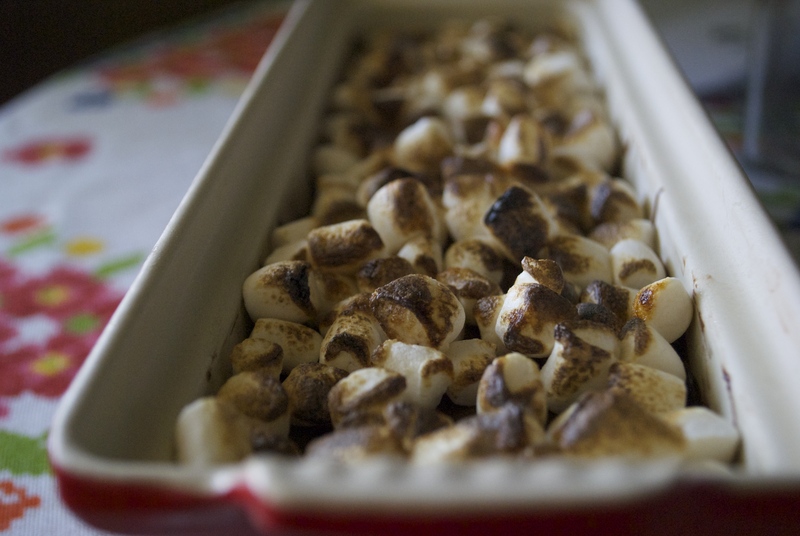 I used Dandies, but next time, I think I’d rather make an aquafaba marshmallow fluff toppping from scratch or use Suzanne’s Ricemellow Creme, so no added heat is required. I used a crème brûlée torch to toast my Dandies–if you decide to use them and don’t have a torch, stick them under a broiler for a few seconds. Not too long, or your ice box cake will melt. Otherwise, here’s what you need to do. Place a layer of graham crackers on the bottom of your pan. Make a double recipe of the mousse using the link above. Pour some of the mousse over the graham crackers using a rubber spatula to smooth and spread. Layer more grahams. Then more mousse and so on until you are near the top of your loaf pan and out of mousse. The top layer should be mousse. Cover and refrigerate your cake for a couple of hours until the mousse is set. Pull it from the fridge and add your chosen marshmallow top. The cake is sliceable and delicious served cold. The mousse recipe is also fabulous on its own if you don’t feel like putting together a cake. However, this is SO easy and looks/tastes amazing. It’s a nice hot weather dessert that looks fancy without having to turn on your oven. ← Vegan “Gouda” Mac and Cheese w/ Peaches & Veggie Pancetta.